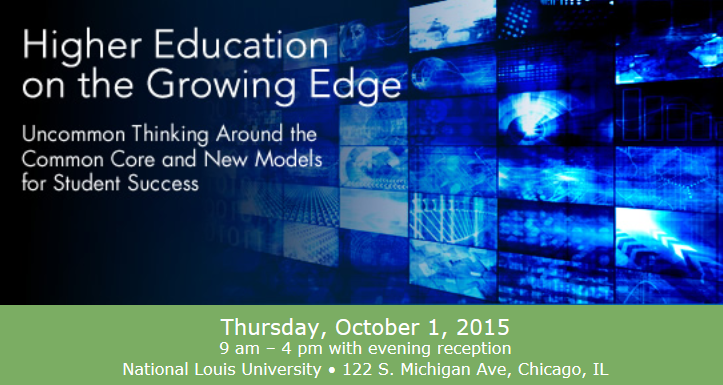 National Louis University, with support from the Bill & Melinda Gates Foundation, will host a gathering of education’s most innovative and progressive experts to uncover new solutions to enduring barriers that prevent access to and persistence through higher education for millions of American students. Due to rising tuition—and rising debt—coupled with growing un- and underemployment for graduates, college’s value proposition has been called sharply into question. For a large contingent of tomorrow’s college students, higher education’s predominantly one-size-fits-all model oftentimes falls short of students’ needs and interests. The "non-traditional" student has become the "new traditional" learner. Coupled with the need to bring a much larger percentage of our population to successful completion of a bachelor’s degree, American higher education—particularly the private, independent sector—must adapt and change to effectively meet these needs and deliver on the promise of equity and opportunity. What opportunities exist for colleges and universities to foster the transition from high school to higher education, and how can skills and knowledge set forth in the Common Core be scaffolded and leveraged to support student success? Research on human learning and development has made great strides in the last decade. Innovative learning technologies have exploded forcing change within a traditionally stalwart system of higher learning. Meanwhile, the Common Core has emerged to provide a consistent road map to achieve relevant learning outcomes in K-12. How can higher education effectively link and utilize these advances to enhance college student success? In today's higher education environment, liberal arts programs are criticized for not adequately preparing students for the job market, and professional and vocational programs are criticized for focusing too narrowly on industry skills that risk becoming outdated or redundant before a student even graduates. Higher education, especially private, independent institutions, must provide a new value proposition that links learning seamlessly in a world that requires P-20 continuity and integration. Only through this effort can we make it a reality for the 70-80% of the population who will need a degree to maintain economic viability in the next decade. What is the new value proposition for higher education? Should the changing ecology of higher education extend the work of P-12 and the Common Core, which promises to equip students with the “skills and knowledge necessary to succeed [in college,] career and life”? Thille, C., Mitchell, J., & Stevens, M. (2015). What we've learned from MOOCs. Inside Higher Ed. Paepcke, A., Kizilcec, R., Kindel, A., & Stevens, M. (2015). Research summary: 2013-2015. Stanford Lytics Lab, Stanford University.